42x10x34 inches. 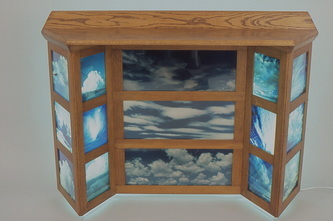 This oak hall table has a collection of my sky photographs. The side chambers contain light fixtures to illuminate the translucent images from behind. The table stands on clear plexiglass risers to give the impression of floating just off the floor. Sold.